Dear readers, I want to bring more simple and flavorful recipes to your table. 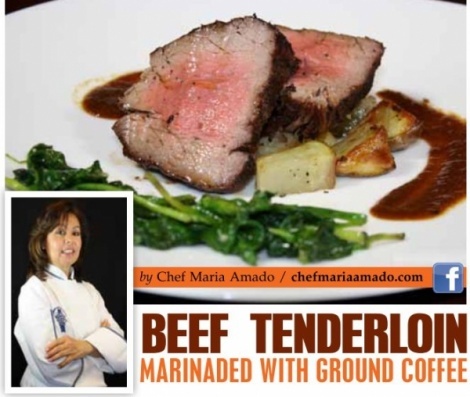 This Beef Tenderloin, marinated with ground coffee, has an intense and exotic flavor, perfect to serve in this holiday. Serve it with demi-glace sauce, roasted potatoes, sautéed broccolini, a great wine, and a beautiful table to pull out all the stops. You can prepare the sauce in advance. Happy Holidays! And once again, Thanks for supporting my work! 1. Rub the beef with salt to taste, mix the rest of the ingredients and rub the beef. Keep in the refrigerator in a closed container overnight. Preheat oven at 450 F 2. Heat a large ovenproof skillet over medium-high heat, coat with olive oil. Add the beef and browning on all sides, for 5 minutes. Place the tenderloin in the oven and bake for 20 minutes or until a thermometer registers 140 (mediumrare). Take the beef out of the oven and cover loosely with foil. Let stand 9 minutes. Cut the tenderloin into thin slices; serve with roasted potatoes, broccolini and a demi-glace sauce. For the Demi-Glace Sauce recipe go to www.chefmariaamado- Salsas y Marinados- Salsa Demi-glace.